I have a sample of this cleanser from before and I really like it. It's a gentle, soap free cleanser that removes makeup and nourishes the skin. I prefer this as a second cleanser though, I like balms and oils for actual makeup removal. But this is a nice cleanser! This is a light weight gel with small gentle scrubby particles in it to remove dead skin cells. I've not tried this yet but I really like NUXE skincare so I'm sure I will love this to. Another famous Nuxe product is this oil. It's a multi purpose dry oil that can be used on the hair and body. It has a whole load of brilliant ingredients to nourish, repair and soften! How cute is the tiny liquid Lipstick. There's just something about mini makeup that I love! I really like that there's a makeup option this month! I haven't actually used this yet but it sounds promising; it's packed with lip nourishing ingredients and promises to be long lasting. I'm not going to lie this months mix of products was kind of disappointing. There was a few products that have been in the edit before. But if your new to Love Me Beauty then this shouldn't be a problem. 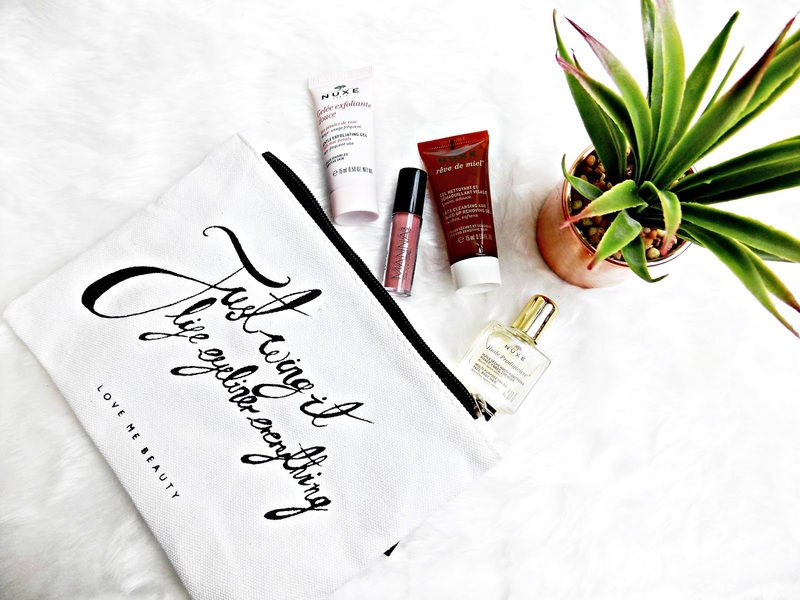 But overall, I still love the concept and it's one of my favourite beauty subscriptions on the market! You can sign up to Love Me Beauty here. Don't forget you can get 20% of you first order with the code: lpbeautyblog20. Have you tried Love Me Beauty? What are your thoughts?